Article presents the problem of the detection and cancelation of impulse noise in acoustic signals using an Exponentially Weighted Least Squares (EWLS) and next step error prediction analysis. When listening to archival music records we often meet (or more precisely hear) the problem of impulse noises occurrence – so called ‘crackles’. It is getting worse when listening to vinyl records or cassette tapes. There are many algorithms whose task is to remove such distortions – some are suitable for hardware implementation, some of them can be used only in offline implementations. This article is to present adoption of identification method Exponentially Weighted Least Squares (EWLS) and next step error prediction analysis. Despite the fact that this algorithm will be used to detect and cancel noise in recorded music, it can successfully be used to cancel impulse noise from any set of even multidimensional signals. Acoustic signals which are present in our real world are time-continuous signals, and in this form are recorded on analog media such as vinyl records or cassettes. Recording on the more modern digital data media (CDs, hard drives, Flash memory) requires digitization of the analog signal - sampling and quantization. Sound frequencies heard by the human ear are in the range of about 20 kHz. According to Nyquist - Shannon theorem the sampling frequency should be at least twice of highest frequency peak in signal spectrum in order to avoid the effect of aliasing. In the processing of music we used set sampling frequency of 44.1 kHz. In the article it will be assumed that processed signal is digital and was sampled correctly according to Nyquist – Shannon theorem. where represents signal sample value in moment , represents time shift operator, represents rank of AR model, represents ith model parameter, represents white noise. If we will assume that vector represents real (unknown to us) parameters of signal, then we can assume that there is a vector which is estimation of vector . Due to equation above, if want to calculate signal value prediction for the next step we need to designate vector , as vector is given as an outcome of previous operations. To calculate we will use Exponentially Weighed Least Squares algorithm. EWLS algorithm, as every in the least squares algorithms family, calculates model parameters by minimizing cost function on least squares – in EWLS it gives exponentially less weight to previous error values. To reduce the impact of older values to the current calculation we need to assume a so called forgetting factor . The forgetting factor takes value from 0 to 1, wherein if then EWLS algorithm’s memory is shorter. Impulse noises in two dimensional signal can be seen as samples with amplitude much higher than neighboring samples (Fig.1). Noise detection refers to verify the value of . Naturally, higher value of error function in moment indicates that signal value in this moment is disturbed. Obviously, the condition given above is strongly fuzzy – what does it mean ‘higher value of error function’? where is scaling coefficient which is responsible for algorithm sensitivity and need to be defined as algorithm input data. Note that too high value may cause missing disturbed samples, whereas too low value may cause classifying ‘clean’ samples as disturbed ones. Sample marked as disturbed is to be deleted and replaced with reconstructed one. For this purpose we will apply linear interpolation using neighboring ‘clean’ samples. where indicates position of sample under reconstruction in the step. A 20 second length music record was processed with algorithm, results can be seen at Fig. 2 and 3. Implementation of this algorithm in Matlab environment is quite easy, as a lot of predefined functions can support us. %   parameters should be saved. Milestones of this function are shown below. as we need to collect at least model rank samples number to start identification and our implemention considers that next four samples can be distrubed. Presented recursive algorithm can be implemented in real-time applications. The delay produced by this algorithm is defined by the maximum number of next samples that can be disturbed. Acoustic signals considered in this article by the nature are characterized by their high dynamic of amplitude changes. Due to this are signals types can successfully be processed with this algorithm (for example measurement data). Niedźwiecki M. Kłaput T. Fast recursive basis function estimators for identification of time-varying processes., IEEE Transactions on signal processing, vol. 50, no. 8, pp. 1925 - 1934. August, 2002. Söderström T. Stoica P. System identyfication. Prentice-Hall International, Hemel Hempstead, 1989. Zieliński Tomasz P. Cyfrowe przetwarzanie sygnałów. Wydawnictwa Komunikacji i Łączności, Warszawa, 2005. After graduating with a degree of Master of Science, Engineer in Automation and Robotics (at the Gdansk University of Technology) began his career as a Service Engineer of Ships' Systems. He spent four years in this profession and had a lot of places all over the world visited. 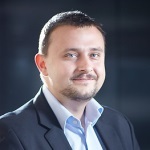 In 2012 he started to work for Polish energy company ENERGA (ENERGA Agregator LLC, ENERGA Innowacje LLC and Enspirion LLC) as Systems Engineer and Solutions Architect. Thereafter he participated in few large-scale research projects in the field of Information Technology and Systems Integration for Energy & Power Management and Demand Response applications as a Solution Architect, Business Architect or Project Manager. His private interests include Signal and Image Processing, Adaptive Algorithms and Theory of Probability. A room is just considered to be a low-pass filter, at least in the classical Sabine formula. Very nice article Jakub. Well reserached and well written. Useful information for the community. Best Wishes.